Liverpool showed their intent by paying a club record sum of 75 pounds for double League champion inside-right Jimmy Ross from Preston's "Invincibles." It was an ambitious signing as Ross was a legend at Preston, scoring 18 goals in Preston's undefeated season and seven goals in Preston's record 26-0 win vs Hyde in the 1887-1888 season. He was also the lLeague's top scorer in the 1889-1890 season with 24 goals. He was the younger brother of Preston's brilliant defender Nick "Demon back" Ross, who died of tuberculosis in 1894, at the age of 31. The transfer didn't go through without a hitch as Nick had evidently on his deathbed made Jimmy promise that he would never leave Preston. This lead to “strained and awkward relations” between Jimmy and Liverpool for a while. Liverpool had already paid £75 for Jimmy and he kept his part of the deal and made his Liverpool debut in the fourth game of the season. Sadly, Jimmy contracted an acute skin disease, Erysipelas, succumbed to raging fever and passed away only 36 years of age on 12th June, 1902. Sadly, Jimmy contracted an acute skin disease, succumbed to raging fever and passed away only 36 years of age on 12th June, 1902. The new main stand can be seen on the top of the picture. Liverpool started the season by drawing two away games, before playing their first ever 1st division game at Anfield, which was a big occasion for the club: "The Liverpool Club opened the Anfield enclosure on Saturday, when they were visited by last year's champions, the Aston Villa. Long before the players appeared on the field it was evident that the gate was to be a phenomenal one. 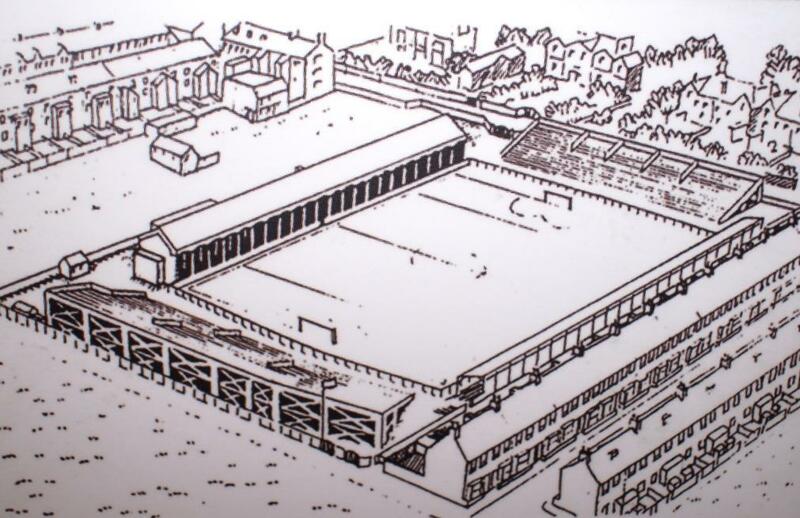 The ground was in the pink of condition, and the new stand [the main stand], with its huge seating capacity, added to the attractiveness of the scene. The interval was enlivened by selections of music given by the Liverpool Carters' Band, and the ground was paraded by the Lord Mayor, Councillors Houlding, Grant, Brooks, Hawley, and other notables, who came in for a ovation from all quarters." 20,000 people were in attendance at Anfield, a new record as last season's capacity had been 17,000. Liverpool were leading at half-time 1-0 with Bradshaw's "magnificent shot", but the Villains scored twice in second half and celebrated an away win. Liverpool's rapid rise had been nothing short of incredible, but the team was not quite ready for the first division. The Blue and Whites lost 3 out of the next 5, among them 0-5 vs. WBA and drawing the other two. Liverpool Mercury blamed the players for not being fit enough: "There are some of the team who do not take that care of themselves they should do. They seem to think that if they pay attention to the usual order of training once or twice a day the remaining portion of the time is to be spent as they think fit. This is altogether a mistaken notion, and is one some of the players will do well to dispel at once. By now they should have found out the truth of the old adage 'It's the pace that kills,' and the sustained speed at which First league games are carried out is only to be obtained by the most assiduous training, and, above all, careful and strict living. Where the team last year used to shine, in finishing so strongly, now is the weakest point of their play, and it behoves the whole team to at once bestir themselves and mend this fault, or else they will assuredly kill the goose that lays the golden eggs." The players of Liverpool were not the only ones who were criticised for their performances, but also the fans at Anfield: "A certain section of the spectators made themselves particularly offensive by the use of foul and filthy language levelled at certain players, and as a matter of consequence their displays suffer deterioration, through no fault of their own. It is most unsportmanlike and altogether un-English in fashion to hurl threats and execrations at those who are powerless to reply. The intentional jeers and jibes at one player in particular, when doing his best, cannot come from any fair-minded person who wishes the sport to thrive in this corner of the county." 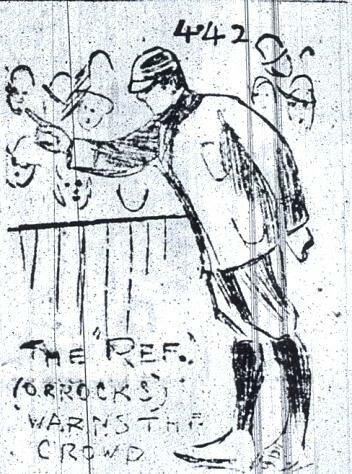 The referee warns spectators that they better behave! Losing 4 and drawing 4 wasn't the ideal preparation for 13th of October when Everton and Liverpool faced each other for the first time in the top flight: "The match will prove a memorable one in the annals of local football. It is really between two branches of the same family, who have been in open hostility in the past, but who now join issue in the same sportmanlike spirit in which any other two organisations, as becomes the dignity of the League, would do. Knowing the players individually as we do, we feel sure if play develops any unseemly aspects it will be the fault of the spectators, who are admonished to control their feelings." President Houlding was determined to succeed against his former club and hoped a positive result could turn the club's fortunes around. The spectators behaved in a civilized manner and a capital crowd of 44,000 people saw Everton beat Liverpool 0-3 at sold-out Goodison Park. As a result Everton were at the top of the league, having won all 8 games, but Liverpool third from bottom with only four points. Anfielders finally won their first game of the season on 20th of October at Anfield 2-0 vs. second from bottom Stoke, but then lost 0-5 to Aston Villa at Villa Park, 0-3 to Burnley and 1-3 to Stoke. The main stand at Anfield which was built in 1894, a modest pavilion with its distinctive muck Tudor central gable. It measured 360 ft long with eleven tiers of seats with a balcony at the back with the roof so placed that even in the rear every portion of the ground was visible. 3,000 spectators could sit there and between the stand and the touchline were three rows which acommodated a further 2,000. Kelso took the lead for Everton from the penalty spot in the first half. David Hannah, who had arrived two weeks earlier from Sunderland to boost the forward line, equalised for Liverpool in the 55th minute with a "grand shot". The goal was so magnificent that it "almost sent the crowd frantic, even the Evertonians applauding the home team for their gallant play." Everton regained the lead through Latta, but when only a few minutes were left Liverpool were awarded a penalty from which Ross scored. Result 2-2 in a game "that had not a dull period." "Blue and Whites" fans hoped this great performance would encourage the team to greater things and Liverpool certainly looked the part in the following game vs. Sunderland at Newcastle Road. McVean and David Hannah scored in the last 10 minutes of the first half and "everyone was aghast and dismayed, and Tom Watson, the genial official and linesman, walked about with his broad and usually merry face as long as a fiddle." Watson, the future Liverpool manager, or Secretary as it was called in those days, was encouraged by Sunderland's display in the second half. Liverpool brought two forwards almost back to the half-back line, determined to hang on to their lead but conceded three goals, 2-3 to Sunderland. Liverpool's games were exciting and the team scoring at will at this point, inspired by Hannah's arrival, "Ross' influence and tactics" and "since Bradshaw has been promoted to the onerous position in the centre his career has been one of unvarnished brilliance." The problem was that Liverpool were conceding just as many, three on average, but the "universal question each asked his neighbour was, 'How is it that such a team as this is at the bottom of the League?'" Liverpool improved as they entered 1895, beating WBA 4-0 on New Years' Day but losing 0-5 to The Wednesday four days later. This "farcical show at Olive Grove" as it was called didn't put them off track and three straight league wins gave everybody renewed hope. Farcical would be a better description of Liverpool's first round game vs. Barnsley St Peters in the FA Cup on 2nd of February. Liverpool won the game 2-1 after extra-time, but as the Liverpool Daily Post reported: "At the close of the game, the Barnsley officials laid a protest with the referee in accordance with Rule 17 which provides that extra-time can be only be ordered if both clubs mutually consent. Prior to extra-time being started, Barnsley protested and evidently the match will have to be counted as a draw and replayed at Liverpool." Jimmy Ross' goal in the 113th minute hadn't proved decisive after all. Barnsley were defeated 4-0 in the replay at Anfield. Liverpool were next drawn at home vs Nottingham Forest which was comforting as Forest had been beaten comprehensively 5-0 at Anfield a month earlier. Liverpool came up short this time and Forest knocked them out by two goals to nil. Three weeks later Liverpool lost again to Nottingham Forest 0-3 at Town ground in the league and local media voiced everybody's concern: "Are Liverpool going to escape the Test match or not?" Liverpool lost two and drew one in their last three league games and finished bottom, having to face 2nd division Bury in the Test Match which determined if 1st or 2nd division football would be on offer next season at Anfield. Liverpool Mercury was confident: "Excitement runs high as to the fortune of the Liverpool Club against Bury at Blackburn, but the Anfield-road players should not experience any difficulty in disposing of the Second League champions if they settle down to their work in earnest fashion." Liverpool's team was seriously depleted before the game without regulars David Hannah, Joe McQue, Duncan McLean, Frank Becton and John McCartney. Liverpool lost 0-1 to Bury and were relegated. A major set-back for the ambitious Houlding. "The annual picnic of the committee, players and friends of Liverpool Association Football Club took place on Saturday last. A party numbering almost 50 in all, left the Sandon Hotel about two pm in waggonettes, and arrived at Eastham's Victoria Recreation Grounds, Ormskirk about four pm. Under the management of Meers Bailey and Gibson a sports programme was carried out, and afterwards a capital tea was provided. Mr William Houlding, after complimenting all upon their good fortune in being favoured with such grand weather, and expressing a hope that the club and players would pull together during the coming season, distributed the prizes to the following successful competitors: - 120 yards' Handicap: 1, Geary. scratch: 2, Goldie; 3, J McLean. Dribbling contest: 1, Ross; 2, Geary. Place kicking: 1, Dunlop, 60 yards; 2, Beckton, 58½ yards. 220 yards: 1, J McLean; 2, McVean; 3, Curran. Half mile: 1, McCartney; 2, McQue; 3, Whitehead. Steward's race: Clegg 1; R Bailey 2. The whole arrangements were under the supervision of Mr. Ramsey." Liverpool bought a number of strong players for the dogfight ahead in the 2nd division. Instant promotion was the order of the day. Full-back Archie Goldie (149 games for Liverpool /1 goal) was brought over from Clyde, a new goalkeeper, Harry Storer (121 games) came mid season from Woolwich Arsenal, English international forward Fred Geary (45/14) was bought for 60 pounds from Everton and most importantly George Allan (96/56) arrived from Leith Athletic. English international Frank Becton, who had been bought late in the previous season from Preston for 100 pounds, blossomed in the 2nd division, scoring 18 goals in 24 league games. Scottish left-back Billy Dunlop, was progressing after arriving from Abercorn in January. He went on to play an impressive 363 games for Liverpool in the next 8 years. It was George Allan whose star shone the brightest as he scored no less than 25 goals in 20 league games in a season where Liverpool scored a record 106 goals on their way to the 2nd division title and registering their biggest ever league win when beating Rotherham 10-1 where Liverpool scored six goals in the opening ten minutes! Allan would no doubt have scored more goals if he had not been suspended for 8 matches from 14th October to 30th November for signing contracts both with Liverpool and St Bernard's FC upon leaving Leith Athletic in Scotland. Liverpool Mercury praised Liverpool for their achievements: "Liverpool, by again securing the Second Division Championship, have created another record and covered themselves with well-earned honour and fame, and are, indeed, worthy of the title of football "record breakers". In the brief, but brilliantly meteoric existence the club has seen, their performances have been of the most startling order, and the outcome of real merit; and if the fates this year prove unpropitious towards the Anfield club in their endeavours to regain a position in first class football, their directors may yet claim another record in being persistently followed by the vilest luck, such as never dogged the efforts of any other football club before." The 2nd division title however didn't mean automatic promotion and Liverpool had to take part in a 4-team mini league of test matches with 2nd place Manchester City and 1st division's Small Heath and WBA. Two teams out of these four would play in the 1st division next season. Liverpool signalled their intentions by beating Small Heath convincingly at Anfield, 4-0 in front of 20,000 spectators. The return match at Coventry Road was goalless but Liverpool beat WBA 2-0 at Anfield with goals from Bradshaw and Allan. With one game to go Liverpool were back in the 1st division! NEXT WEEK: A monumental change at Liverpool, a truly new successful era in new colors!